Last week’s Friday Question of the Day gave us tons of great cheap eats recommendations. I gotta share one more that sounds pretty good. This month, BOURBON STEAK is bringing back its popular off-menu special: a Red Apron half-smoke and a stout, served in the bar and lounge only Sundays through Thursdays for $7. The “Smoke n’ Stout” will be available beginning Wednesday, February 1st and running through Wednesday, February 29th. A combination of locally sourced dry-aged beef and pork, Red Apron’s half-smokes are spiced with black pepper, white cardamom, garlic, nutmeg, smoked beer and bacon. Executive Chef Adam Sobel dresses the dogs in two distinct styles with housemade toppings of Venison chili with charred jalapeno and cheddar cheese whiz and “NY Cart Style” with sauerkraut and spicy ketchup onions. This offer will be available in the bar and lounge Sunday-Thursday from 11:30 AM – 11:00 PM, Friday from 11:30 AM to 12:00 AM, Saturday 5:30 PM to 12:00 AM and Sunday from 5:30 PM to 11:00 PM. 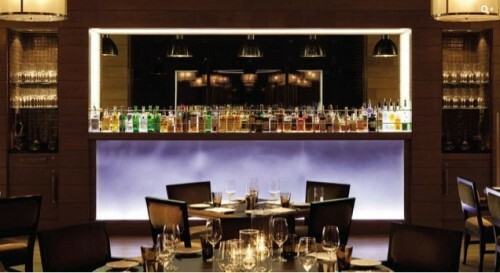 BOURBON STEAK is located in Four Seasons Hotel at 2800 Pennsylvania Avenue, N.W.